A few years ago I did a couple of recycling projects with pop cans. I have to say that I was surprised to find that the aluminum is actually not that sharp when the edge is cut with scissors. It seems that the scissors actually somehow finish the edge in such a way that it’s no longer dangerously sharp. I can’t find the original blog tutorial I used, but I’ve found a few others that give step by step instructions. Check out the tutorials on Little House in the Suburbs and Veggie Delight for great instructions for making garden markers. I wasn’t blogging at the time, so I don’t have step by step photos of my project, but I made little markers for my herbs. Mine were more similar to those on Veggie Delight and hung from twisted pieces of metal cut from an old wire clothes hanger. Cutting the hanger was actually the most difficult part of the project. This was whipped up in about 5 minutes just so I’d have a picture to post. I made it for my tulips because that is the only evidence of life in my garden right now. I added a little touch of permanent black marker to the raised lettering just to add a bit of dimension and make the lettering stand out a bit. Basically, all you do is cut the top and bottom off of a clean pop can. Trace out your shapes on the outside of the can (printed side) and then cut them out with scissors. One post suggests using an old ball point pen, but I used my embossing tools. I think that a dull pencil would also work well. You just want to make sure that you don’t poke a hole through the aluminum. If you want to get the “border look” around the edge, what you want to do is trace your shape and then instead of cutting on the traced line, cut about 1/4″ outside of the line you traced. When tracing the lettering, you will need to do so in reverse (mirror image). The easiest way to do this is to print the lettering on clear cellophane and then lay it on the cut out shape in reverse, so that when you trace it on the coloured outside of the tin, it will appeared raised on the opposite side with the plain metal. Another option is to find a font you like and print it off on your computer at the exact size you’ll need. When you go to print, select the “reverse” setting on your printer. You can then set the paper over the back and trace over top of it. The dots around the edge can be made the same the lettering is done using an embossing tool, old pen or dull pencil. These look great in your potted plants or marking the rows in your garden, but also make a cute little addition to a plant that you purchase as a gift. This is a simple project, but the result is really cute. Get creative and see what you come up with! 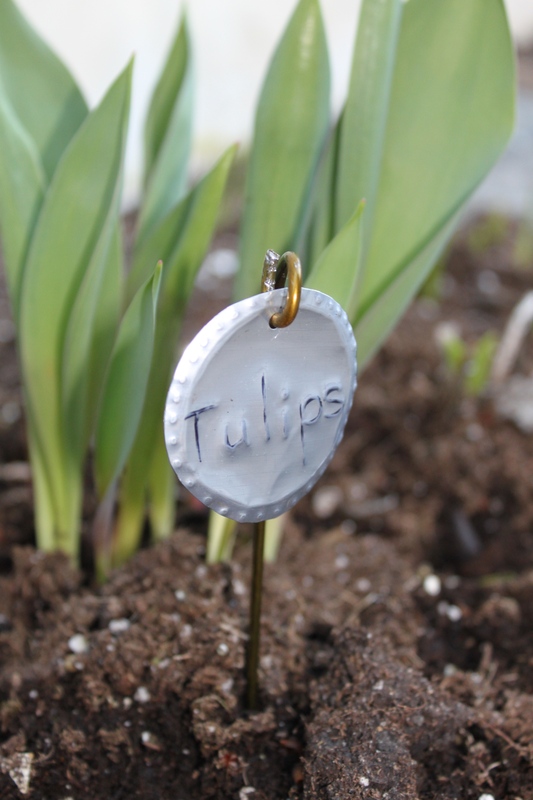 Posted on May 22, 2014 by Cindy Roy •	This entry was posted in DIY and Upcycling and tagged aluminum can garden markers, aluminum can upcycle, aluminum plant markers, garden markers, plant markers. Bookmark the permalink.